The few memories I have of running this event five years ago are the kind I like to recount for their oddity, at least when comparing them to running competitions I’ve participated in anywhere else in the world. The start of the event was unclear. I remember standing around in a mass of people and suddenly people began to move – this was about ten minutes before the official start time. As I trotted along with my likewise confused running buddies, I shouted out in Chinese something like “Did we start already?” and got a swift response from an official on the sidelines of “Yes! Add oil!” And so that’s how we began the 10K. (I remember L said something about scrambling off stage after leading Heyrobics to put his running shoes on because he too was caught off guard.) What I next remember is that as we looped around the mausoleum and monument in the middle, several runners very obviously hopped barriers to get ahead of other competitors. Race officials on the sidelines ran after them waving their arms and shouting “Bu xing, bu xing!! !” (not OK) but it was too late. They had successfully sprinted ahead and cut a few hundred meters off their races. (I was later told by a Beijinger that one reason for this could be that the race results are used by some towards fulfilling some kind of physical education criteria at high schools and universities, but I can’t confirm that.) Then there was the course itself. I ran most of it on my own, although I did have a lot of men over the age of 50 running next to me most the time, many of whom seemed surprised that I could strike up a conversation with them in Chinese. They, and many smiling spectators, shouted the familiar “Add oil!” I had become used to as a runner in Beijing. There was also something I had never seen when racing before in China: army officers with stoic faces lining many of the avenues. I often wonder about their purpose — were they protecting runners from the horrendous traffic in central Beijing or potentially rowdy spectators? Or were they there to stop anyone who thought it might be a good opportunity to start a protest? One never really knows in Beijing. The finish line itself was a non-event for me, except for the fact that it was in the historically significant Xiannongtan stadium. 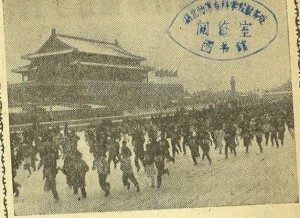 Initially built during the Republican period, I knew from my research that the stadium had been heavily used until the Beijing Workers’ Stadium opened in 1959. … In this race I finished somewhere under 50 minutes but nowhere near the top competition. I was handed a water bottle and that was it. Unfortunately, I don’t have any personal photos from 2011, but a quick Google search shows that many others have taken photos of the event and Getty has since put images online of the 2015 edition. (Photos from 2011 are recognizable for the puking-green colored t-shirts with the li-ning logo on them that we all received in the goodie bag.) But given the history and route of this event, and the fact that someone else went through the pains to register our group, I feel privileged in retrospect to have been given the chance to run in it at all. *This is not a post where I discuss why I think Zuckerberg ran through Tiananmen to begin with. There’s enough online about that already and frankly I could care less about why he chose to do it. 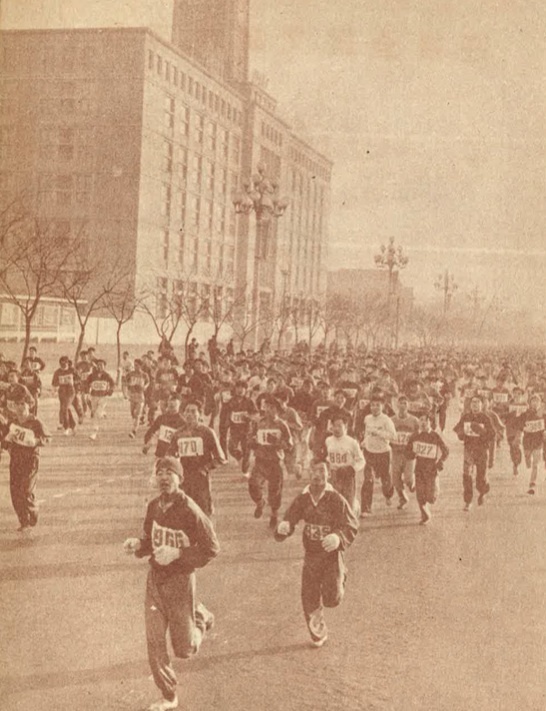 These two posts are related specifically to my own experiences running in central Beijing.